수종사 팔각오층석탑은 경기도 남양주 운길산 중턱에 위치한 수종사에 전해오는 조선시대의 석탑이다. 수종사는 대한불교 조계종 제25교구 본사인 봉선사(奉先寺)의 말사로 조선 세조 5년(1459)에 창건되었다고 전해온다. 석탑은 원래 사찰 동편의 능선 위에 세워져 있었다고 전하며, 이 위치에서는 남한강과 북한강이 모이는 양수리 지역이 훤히 내려다보여 경관이 우수한 입지를 가지고 있다. 현재는 석조부도, 소형석탑과 함께 대웅전 옆에 옮겨져 있다. 수종사 팔각오층석탑은 평창 월정사 팔각구층석탑이나 북한지역 향산 보현사 팔각십삼층석탑과 같은 고려시대 팔각석탑의 전통을 이으면서 규모가 작아지고 장식적으로 변모한 조선초기 석탑의 형태를 잘 보여준다. 이 탑에서는 1957년 해체수리 시에 1층 탑신과 옥개석, 기단 중대석에서 19구의 불상이 발견되었고, 1970년 이전 시에는 2층, 3층 옥개석에서 12구의 불상이 발견되었다. 함께 발견된 묵서명을 통해서 이 불상들 가운데 태종의 후궁이었던 명빈 김씨(?-1479)가 발원조성하고, 성종의 후궁들이 홍치 6년(1493)에 납입했다고 하는 불상 2구(석가여래 1구와 관음보살 1구)와 인목대비(정의대왕대비)의 발원으로 조성된 금동불·보살상들, 숭정원년(1628)에 화원[조각승] 성인(性仁)이 조성한 금동비로자나불좌상(대좌바닥에 명문음각)이 확인되어, 석탑 건립의 하한은 1493년이며 1628년에 중수된 것을 알 수 있다. 탑의 형태는 지대석 위에 팔각의 대석을 올리고 그 위에 불상의 팔각연화대좌와 같은 형식의 기단이 올려져 있다. 팔각 대석의 각 면을 2등분하여 장방형의 액(額)을 새기고 그 안에 안상(眼象)을 표현하였다. 같은 형태의 안상은 기단의 받침과 탑신 받침에도 통일되게 새겨져 있다. 기단부는 상대 앙련석과 하대 복련석에 16엽의 연화문이 장식되어 있는데, 연판(蓮瓣)에는 고려중기부터 유행했던 화려한 꽃머리 장식이 새겨져 있고, 팔각 중대석에는 각 모서리에 원형의 우주(隅柱)가 입체적으로 조각되었다. 5층의 탑신 역시 팔각 모서리에 원형의 우주가 새겨져 있고 옥개석에는 각각 3단의 받침이 새겨져 있다. 옥개석 처마의 부드러운 곡선과 원형 기둥, 옥개받침 등은 목조 건축을 석재로 옮긴 모습을 잘 나타낸다. 정상부에는 합각지붕 형태의 삼각형 문양이 조각된 복발과 보주가 올려져 있다. 수종사 팔각오층석탑은 고려시대 팔각석탑의 전통을 이어 조선시대에 건립된 석탑으로 출토된 사리장엄과 명문을 볼 때, 건립연대는 늦어도 1493년에 건립된 이래 1628년에 중수했음을 알 수 있으며, 왕실 발원의 석탑임도 확인된다. 또 양식을 보면 기단부는 불상대좌의 양식이고, 탑신부는 목조건축의 양식이며, 상륜부는 팔작기와지붕의 형태를 나타내고 있다. 이런 형식은 현재까지 조사된 조선시대에 조성된 석탑 중 유일한 팔각오층석탑이다. 이상에서 살펴본 바와 같이 수종사 팔각오층석탑은 건립연대가 확실하고, 각부의 부재가 비교적 온전하게 유지된 조선시대 유일의 팔각오층석탑으로서 역사적·학술적으로 가치가 충분한 것으로 평가된다. 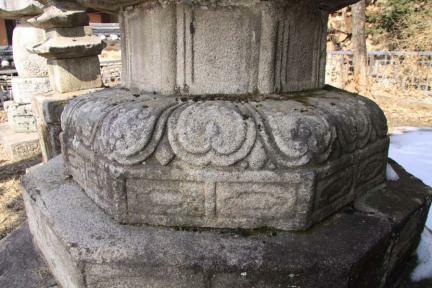 The Octagonal Five-story Stone Pagoda of Sujongsa Temple is a stone structure of Joseon erected on a mid-slope of Ungilsan Mountain in Namyangju, Gyeonggi-do. A subordinate of Bongseonsa Temple, currently the head temple of the 25th Dioc. of the Jogye Order of Korean Buddhism, the temple is known to have been established in 1459. 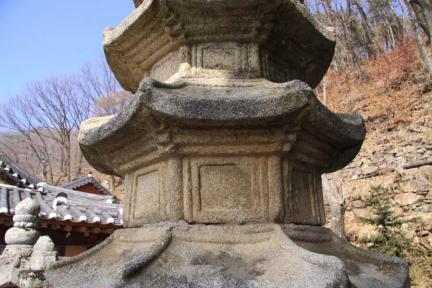 The pagoda was originally set up on a mountain ridge east of the temple overlooking the Yangsuri area where the two main streams of Hangang River (Bukhangang and Namhangang) merge. The pagoda is currently standing in front of Daeungjeon, the central prayer hall of Sujongsa Temple, along with a stone stupa and another smaller pagoda. 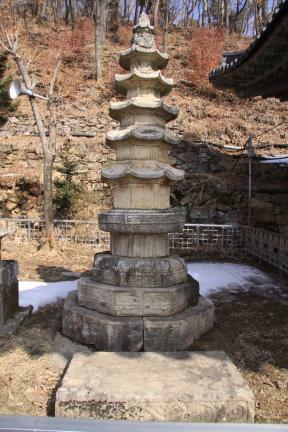 The pagoda is one of the rare examples of the Goryeo pagoda marked by octagonal body; others include the Octagonal Nine-story Pagoda of Woljeongsa Temple in Pyeongchang and the Octagonal Thirteen-story Pagoda of Bohyeonsa Temple in Hyangsan, North Korea, which became significantly reduced and more decorative during the early Joseon Period. Archaeologists found 19 Buddhist statuettes in the first-story body and roof-stone and middle pedestal of the base during a repair work performed in 1957 and 12 more statuettes in the second- and third-story roofstones when it was moved to the current location in 1970.